Mount Bromo is one of the highlights of East Java, Indonesia and is one of the the most visited natural attractions in South East Asia. The immediate gateway to Mount Bromo for tourists is from the city of Surabaya although there are increasingly more tourists visiting it from Bali. Known affectionately by the locals as Gunung Bromo, Mount Bromo is an active volcano located in East Java, Indonesia. Although it stands at only 2.3km and nowhere near the highest mountain in Indonesia, it is probably one of the most well known and definitely the most visited tourist attraction in East Java. Located in the middle of 'Sand Sea' (Lautan Pasir), Mount Bromo is part of the protected reserve, Bromo Tengger Semeru National Park. Our team feels that the beauty of Mount Bromo Sunrise is second only to Tibet's Mount Everest Base Camp Sunrise. It is truly magical, magnificent and memorable! Bring along your own necessities and supplies: water, tissue, towels, and even light snacks if you need to. If you need get anything during the whole sunrise tour, you could only pray to get them from some of the warung (tiny local shops), that is if they even have what you're looking for! 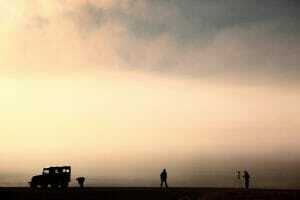 Most visitors to Mount Bromo come for the sunrise tour. If you would like to avoid the crowd, you can consider staying near Mount Bromo. An option would be to stay in one of the hotels at Cemoro Lawang village (e.g. Lava View Hotel). The usual sunrise tour itinerary will start at 3:30am. You will take a jeep to the nearby Mount Penanjakan to catch the magical sunrise. Once you're done taking pictures and videos of the sunrise and the surrounding scenery, take the jeep down to the 'Sandsea'. 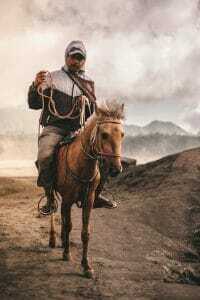 Once you reach the 'Sandsea', the objective is to now reach Bromo crater, either by foot or by a pony ride. It may take up to 1 hour to walk by foot to the crater. A pony ride which will save some time and it will cost you IDR 80,000 (S$8, MYR24, USD6). For a 2-way pony-ride, it will cost you IDR 160,000 (S$16, MYR48, USD12). Once you are done with your sunrise tour, you may want to consider visiting Madakaripura Waterfall. Located 1 hour 30 minutes away (30km), this beautiful waterfall will make you feel like you are a part of the Jurassic Park movie. 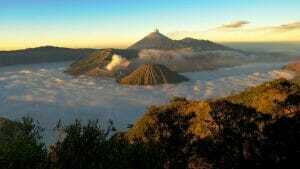 The best time to visit Mount Bromo for its sunrise is during the dry season, between April and October. During this time, May to August is the best months with the least chance of rain and least amount of clouds. Start of your journey by getting on a Damri bus from Surabaya’s Juanda International Airport to Bungurasih (Purabaya) bus terminal in Surabaya city centre. It will cost you IDR 25,000 (S$2.50, MYR8, USD1) and will take not more than 35 minutes (9 km away). From Bungurasih bus terminal, look out for PATAS express bus and hop on your way to Probolinggo. The price per person for 1 way will cost you IDR 40,000 (S$4, MYR12, USD2). Do beware of touts that may overcharge you! Some even go the extra mile by dressing in nice batik shirts to deceive you. Upon reaching Probolinggo, you can take green mini-buses leaving for Cemoro Lawang. 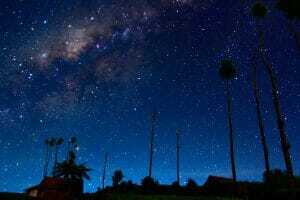 For your info, Cemara Lawang is a small town located near Mount Bromo. The mini-buses are usually park near the terminal and will only leave when there is a full capacity. If there are not enough passengers, you may have to wait for a couple of hours before leaving. If this is not an option for you, you will need to pay the full amount to the driver. It will cost you an additional IDR 250,000 (S$25, MYR75, USD18). Please take note that recently, there are several on-going scams at Probolinggo (for your departure back to Surabaya city). One such example is that there are several non-PATAS buses with PATAS signage at the front of the bus. Remember to only take the official PATAS bus from Bay Number 1 only. The duration for 1 way will be at least 3 hours, however depending on traffic and seasonality, it may even take longer.